The Power Pole connector, made by Anderson, seems to have become a defacto-standard for 13,8V power supply cabling within our region / Radio club. Some club members have the PP30 on all their equipment. 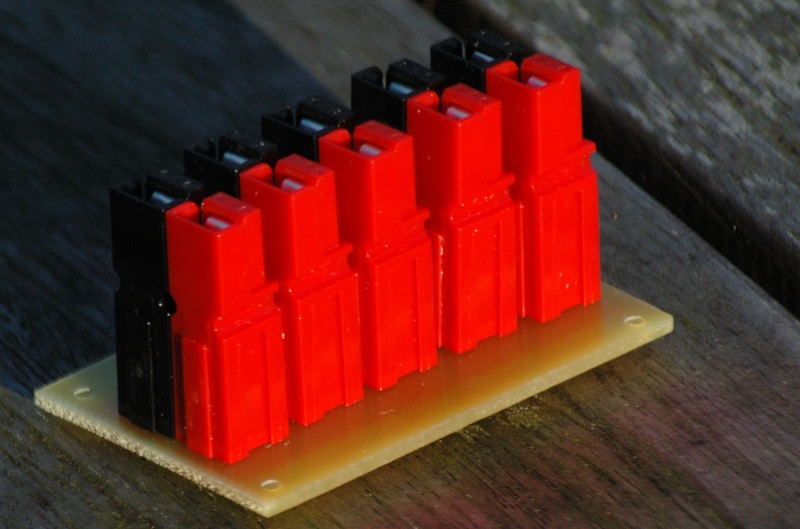 When I visited the Rosmalen flea market last saturday, I purchased a Maxi-Pack (24 pairs of red+black) of the PP30 connectors. Time to make the conversion from banana plugs to PowerPole. 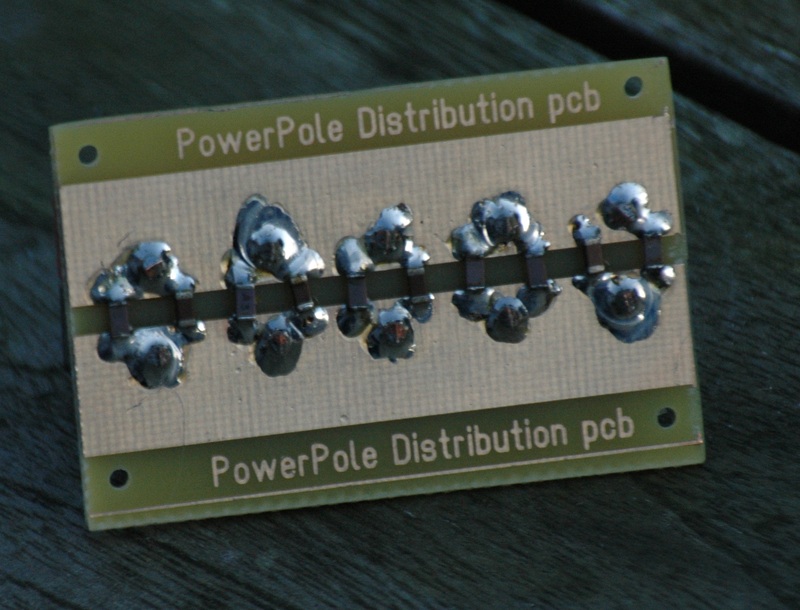 When I made the conversion to the Power Pole system and had mounted Power Pole PP30 connectors on all my 13,8V DC gear, I soon realised that I needed some kind of power-splitting / distribution unit for interconnecting all power cables. There are ready-made distribution boxes on the market, but they are rather expensive. While searching the web, I found several d.i.y. projects. They were my inspiration for my own version, including a simple PCB artwork for easy reproduction. Surface mounted decoupling capacitors (100nF and 1nF, size 1206) are placed near every PP30 connection. These capacitors ensure a good RF decoupling of the Power rail. Dimensions: width 62,2mm x height 33mm (2,45 " x 1,3 "). 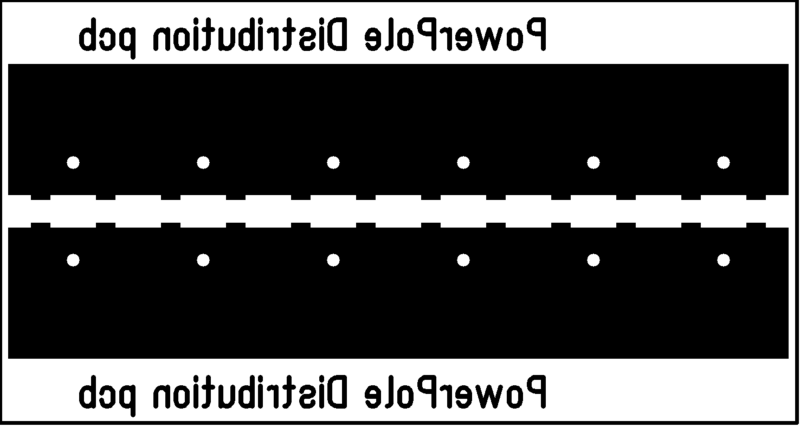 Why a mirrored PCB artwork ? When printed with a Laser Printer onto a transparency sheet, the sheet can be used to transfer the PCB design directly to a positive photosensitive copper-clad board using UV-light source. Then the PCB can be developed and etched. The side with the toner should be in direct contact with the photo sensitive layer to have the sharpest possible image.